Produced in collaboration with Goldsmiths College, Sabanci University, the University of Westminster and the Museum of Contemporary Cuts. 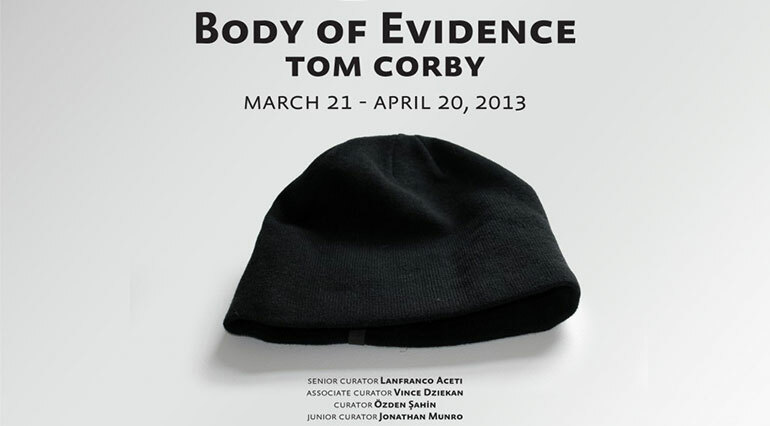 Body of Evidence by British artist Tom Corby, in collaboration with Gavin Baily, is taking place at Kasa Gallery, Istanbul from March 21 to April 20, 2013. The exhibition initiates a series of new artworks and installations designed to blur the boundaries between medicine, data, documentation, economics and art. Conceived as a complex autoportrait of the body undergoing advanced treatment for cancer, the exhibition serves as the primary site where the possibilities, visibilities and public manifestations of the body at its most vulnerable are tested to their limits. Body of Evidence forms part of a larger, multi-faceted project (Blood and Bones) in which the artist faces a complex set of questions about the meaning of life and death. [*] These are fundamental questions that art has wrestled with for centuries. The challenge presented in the case of Tom Corby's exhibition is how to make sense of the relationship between physicality and data; materiality and immateriality; medical intervention and metastasis (where, in the broadest material and clinical sense of the word, the death spiral of the afflicted body is mirrored by the wider economic and environmental ecologies within which it is situated). Employing an idiosyncratic set of approaches to the process of data visualization, the installation is composed of a series of objects related to the artist’s treatment that together act as a physical visualization of the data his illness is producing during his treatment. These data touch upon personal objects such as the hats he wears on a daily basis and which he documents via his blog. Together, these elements reveal a meticulous and methodically structured approach that challenges viewers to detach themselves from all emotional aspects. As the body becomes subjected to the procedures and processes of ordering, selecting, sectioning and framing, it transforms into a grand taxonomic work. In this sense, the exhibition exhibits a certain character typical of the British mindset; particularly, calling upon the indexing fetish attributable to the great scientific explorers of the Victorian era. In this case, however, the exploration that Tom Corby is embarking upon is not across an uncharted ocean, unexplored land mass or previously unseen/inaccessible dimension of physical reality. The exhibition Body in Evidence charts the artist’s expedition inside his own body and across his own soul, exploring the existential data of a body/object subjected to medical intervention; the body as a system that while in the process of shutting down, continues to produce data. In equal parts heroic and obsessive, this project touches on attitudes to death and disease in a wider sense, namely a desire to find ways, processes and forms to transcend the act of termination and come to an accord with our feelings about it. [*] The project also involves Kasa Gallery’s 2013 art residency: Body in Residence. This special international residence focuses on the relationship between human data and the body. During this period, Tom Corby will present his international solo exhibition titled Body of Evidence at Kasa Gallery and, in collaboration with MoCC - the Museum of Contemporary Cuts - will produce a new set of artworks for the exhibition titled No Detectable Level that will analyze the relationship between contemporary financial cuts and the body representing and re-asking basic questions that have been left unanswered. Tom is the Director of CREAM’s Doctoral Programme, deputy Director of CREAM and coordinates the experimental media cluster research at Westminster. He studied Fine Art at Middlesex University (1987) and completed his PhD at Chelsea College of Art & Design in 2001. He has taught at Westminster since 2001 after previously working at Chelsea College of Art and Design and the University of Hertfordshire. His interdisciplinary artworks (in collaboration with Gavin Baily and Jonathan Mackenzie) have been internationally exhibited and have won numerous awards including: nomination for the FILE Festival Digital Language award 2010; the jury nominated award at the 10th Japan Media Arts Festival in 2007; honorary mentions at the Prix Ars Electronica 2006 and 2000; honorary mention: "The Post-Cagian Interactive", "Art on the Net" The Machida City Museum of Arts, Tokyo and the main festival prize Cynet Art 1999. In 2000 he was nominated for the "International Media Art Award 2000", at Zentrum für Kunst und Medientechnologie (ZKM) in Karlsruhe, Germany and was the artist in residence at the ICA London 1998. Reviews include Art Review, Art Monthly, Intercommunication, Artist’s Newsletter and Acoustic Space.